Incorporating more meat free meals is a simple way to look after both our health and our planet. It’s something that’s always in the back of my mind when it comes to meal planning and I’ve been thinking of new ideas that are filling and tasty. 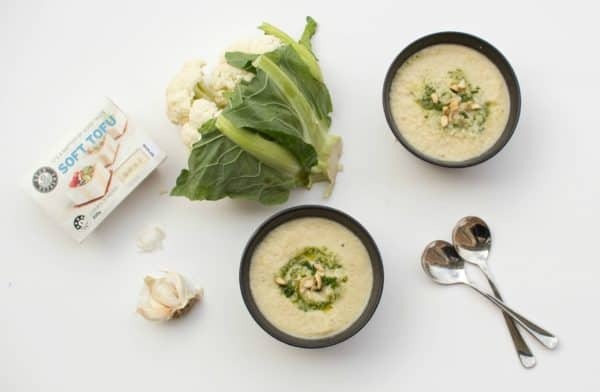 Creamy cauliflower garlic soup and pumpkin cashew fritters are two success stories in my kitchen experiments and they both get a boost of plant based protein from Bean Supreme Soft Tofu. The new Bean Supreme Soft Tofu is made from whole soy beans (no GMO soy!) and has a higher water content than their other tofu, hence it’s softer texture. It is very lightly flavoured so it makes a versatile ingredient to add to dishes, both sweet and savoury. Soft tofu has a soft, creamy texture and is a source of protein, fibre and also provides calcium so it makes a good base for creating meals. 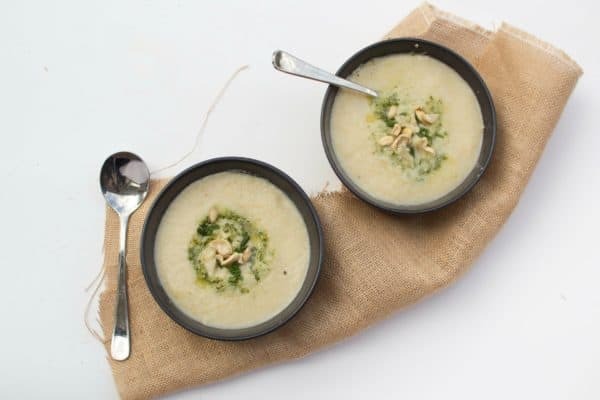 I used the Bean Supreme Soft Tofu in my creamy cauliflower and garlic soup to provide a creamy texture and to boost the protein content. It might sound a little weird, but it really works! The result is a nutritious plant based soup that has a great flavour, creamy texture and is filling too. I also created vegan pumpkin cashew fritters which also have a lovely texture and flavour, thanks to the cashews, turmeric and curry powder. These can be served alongside the soup or as a meal in themselves with a side of coleslaw. ½ cup raw cashew nuts, soaked in boiling water for 20 minutes. Preheat oven to 160 degrees Celsius. Rinse the cauliflower, shake off excess water and cut into florets. Place the cauliflower and the cloves of garlic on a large baking tray, drizzle with the olive oil and season with salt and pepper. Bake for 20 minutes. While the cauliflower is roasting, soak the cashew nuts in boiling water and set aside. Chop the onion in half, then into slices. Rinse and chop the leek into rounds. Place these in a large pot with ½ tablespoon olive oil. Stir over a medium heat for around 5 minutes. Add the vegetable stock and simmer gently. Once finished roasting, squeeze the garlic from the outer shell and add the garlic flesh to the pot along with the cauliflower. Drain the cashews and add to the pot. Simmer for 10 minutes. Take off the heat. Add the tofu and lemon juice. Blend until smooth – if you prefer your soup a little chunky, blend a little less. Add salt and pepper to taste. Top with a swirl of pesto, herbs and cashew nuts. 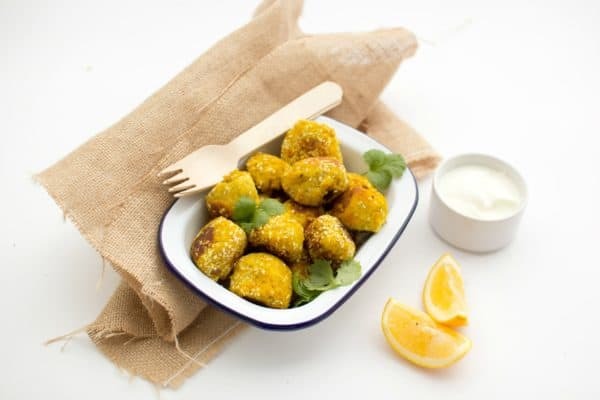 These delicious fritters are full of flavour and nutrition. Serve as a side dish with the soup, or they make a yummy dish in themselves, served alongside brown rice and vegetables. Peel and finely chop the onion and garlic. Place in a medium sized mixing bowl along with the pumpkin, tofu, coconut flour, spices and chia seeds. Mix well. Place cashew nuts in blender or food processor. Pulse until the nuts are very finely chopped – almost like the texture of almond meal, but slightly chunkier. Add the nut mixture to the bowl and mix well to combine. Place the sesame seeds on a plate. With clean hands, roll the mixture into small balls. Coat in sesame seeds and place on an empty plate. Heat a tablespoon of oil in a fry pan over a medium heat. Add the fritters and pan fry until golden brown all over. *I used coconut flour as it is quite absorbent, but feel free to use another type – just add a little more if the mixture feels a bit wet. And thanks to Bean Supreme, for some more healthy recipe inspiration I’ve got Revive Cookbooks 4 & 5 to giveaway. Revive is a popular healthy cafe in Auckland serving up delicious plant based recipes. To be in the draw, simply comment below with why you’d like to win and hit the facebook ‘like’ button below. Prize will be drawn on Monday 11 July and the winner will be announced on this post and notified by email. Open to NZ residents only sorry. This post was made possible thanks to Bean Supreme. Love the healthy and very tasty options…I use these recipes every week! I ,Ove trying new things and this is my go to. The recipe book would be ‘amazing’ to own !!! Oh my god yum! I’d love to win because reading that recipe made my mouth water ???? I love how the revive recipes use alternative options for flavouring! Would love to add these recipe books to my collection! ???? I love trying healthy new recipes ???? I would love to win this prize!! I love finding new plant based recipes to add variety to my meals! Would be awesome to see more of these ???? Always great to have awesome healthy tasty recipes. Would be fantastic to have this recipe book close at hand …. I am not vegetarian but j enjoy the flavors in most vegetarian food and often it’s my first choice when j go out. I would like to be able to cook healthy tasty non meat dishes. I would love to win, I have had my eye on their cookbooks for awhile now so would be a great way to start a collection! Please put me in to win so that I can work my way through the book. The recipes are tasty & healthy & I want to prepare them for my family. We love healthy eating! 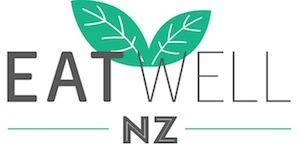 Eat Well NZ! ???????? Recently turned vegan and your books have made this transition so easy! Would love more to add to my collection!! I would love to win the prize as I just LOOOVVVEE Revive cool books!!!!! Thank you thank you thank you! ? Id love to win because the revive cookbooks are amazing and I always love new recipes to grow my meat-free repertoire! Yum! wanna try that soup for sure ???? I would love to win because I’m trying to transition to a plant based diet at the moment and currently have 3 large blocks of tofu in the fridge that I would love some inspiration for. Love revive ???? I’m in desperate need of some new healthy recipes ???? I’d love to win these books because I’d like to do more healthy cooking at home! I would love to win, as i love cooking and eating healthy. I would love to win to get ideas and inspiration to cook more plant based meals and reduce my meat consumption. I would love to have some new healthy recipes to try out, and these ones look delicious! Thanks for sharing these recipes. I will definitely be trying them. I currently have two of the Revive cookbooks out from the library as they are full of yummy healthy recipes and I love that I can also find the ingredients easily. Would love to win a copy of my own. My kids have all gone on a self induced healthy food only kick which is fantastic and I would love the inspiration to get a wide variety of goodness into them! Wow all these recipes look and sound amazing! Im always look for new ideas for our household, this would be lovely to win ?? I would love to win because I have heard awesome things about these books, but am not in the financial position to buy them at the moment. I love experimenting with different vegan recipes ???? We are trying to have more meat free meals for our own healthy and the planet’s, desperately need some inspiration. I would love these to share with my mum and sisters so we can make some yummy healthy meals!! Love your healthy recipes and have your earlier books. I’d love to be able to try out some fresh healthy recipes! I’d love to win this for my family as we continue to learn each day on our wellness journey started in junk free June. Yes please would love to start a more plant based diet! These books would be fantastic!! I would love these recipe books. I partner doesn’t eat a lot of white meat and we both are wary of the effects red meat can generally have on our systems. Guidacne from these books to try some vegetarian recipes would be super helpful ???? I would love to try these books, I’ve heard great things about them! Love to win to get a bit more inspiration and variety into our meals! I covet these cookbooks! Beautiful and delicious. I would love to win so I can share these cookbooks with my sister as we are both trying to eat healthier and these recipes look delicious!! ???????? I have these books and use them all the time but would love to win them so I could give them to a special person who is working extremely hard to eat healthy and is grieving for her Mum who passed away recently. I am always on the hunt for healthy dishes to create at home. I’ve heard these revive cafe cookbooks are amazing!! I’ve been experimenting with tofu recently and really loving it, would be great to win this prize so I have some more delicious and nutritious recipes to try ???? So I can try and eat more healthy fresh meals!! Need the inspiration! I would love to have access to tried and great plant based recipes. It would be great to have access to tried and true plant based recipes. What a neat prize. I’ve just started my lifestyle change to be more proactive about nourishing my body from the inside out. Would be great to have some new recipes to enjoy along the journey and to share with my family and friends. I would love to try some tofu recipes, I’ve been making heaps of healthy recipes lately so would love to win this! I’m training for IronMan, and it’s far far too easy to fuel up on convenience food. I need more cauliflower in my life. And sadly, less muffins. A good friend lent me book number 3 and I have found a bunch of recipes that I love. I’d love to gift her book number 4 or 5 for her collection to repay the gesture. I would love to receive the cookbooks as I am wanting to reduce the amount of meat we eat but am a bit worried that the meals won’t be as tasty. I have book 1 and love it and trying to eat more introduce more vegetarian meals in to our home life ???? We need some new ideas for meals. These recipes are inspiring, I really want my family to be excited about eating healthier food. Always looking for great meat-free meals to impress the meat lovers! I’d love to win 1 of theses books,my Mother has a few and I adore them,I find myself borrowing them all the time.I have started experimenting with lots of different vegetarian meals for my family so would love to have one. I would love to win this as I need more creative and healthy recipes! It’s hard coming up with cool ideas especially with work and uni! I’d love to create more vegan and health concious meals to help convert my family and make a good impact on their wellbeing. As a new vegan any fresh and creative plant based recipe ideas would be so wonderful and appreciated! There’s still so much left for me to learn and cook! I have one Revive cookbook, have loved every recipe I have cooked from it and would be absolutely stoked to win one of the other books! I would like to eat more vegetarian meals and the recipes in these books are so tasty my husband might not miss the meat! I would love to win because revive cafe is my favourite cafe and I go there every time I go up to Auckland! I would love to test out the recipes myself at home and enjoy lots of whole food healthy goodness! Is love to win to add some healthier options to my family’s meal rotation. I’d love to win these cookbooks as I have one already and it’s fantastic. These make life so much easier for me as I can’t eat dairy but never have to think twice with any if these recipes. I’m just discovering the world of plant-based eating and would love some inspiration from these books! ? I need Revive in my life to incorporate delicious vegetables into our life with 6 kids and a meat loving husband! At the moment, they believe veges are a side or add on, so id love to change this and make vegetables the feature of our meals! I’d love to win the cookbooks because I need new inspiration for vegetarian meals! I would love to win this! I need some healthy inspiration for winter. I would love this cook book as I’m trying really hard to introduce more plant-based foods for my diet but am struggling for inspiration. This would really help! Would love to incorporate more fresh healthy recipes into my everyday diet! We’ve started eating mostly meat free now so would love some inspiration for meals!